Chiaogoo T-Spin Tunisian Interchangeable Hook Set are possibly one of the best sets of Bamboo Tunisian hooks you will find. 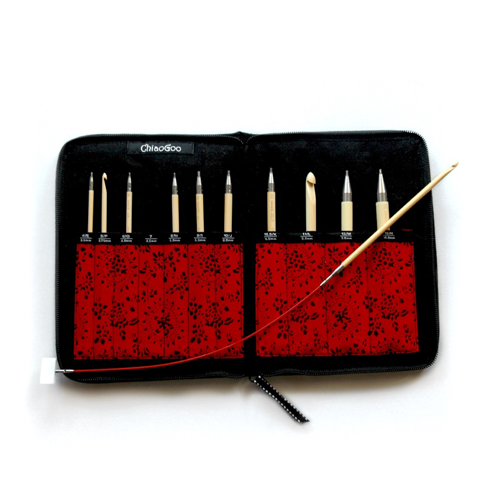 Using the same Moso bamboo found in Chiaogoo's Spin Interchangeables sets, these hooks have a pointy head to get your stitches and the Chiaogoo virtually seamless, stainless steel cable join. The size is permanently laser marked on each hook. These hooks are compatible with either TWIST or SPIN cables and accessories. Size I (5.5 mm) and larger hooks will fit the Large [L] Cables or the Small [S] cables with the use of the Small Cable to Large Tip adapter.